ARCHIMEDES. On hearing his name, shout “Eureka!” Or else: “Give me a fulcrum and I will move the world”. There is also Archimedes’ screw, but you are not expected to know what that is. The Dictionary of Accepted Ideas (1881), trans. Jaques Barzun (1968), 15. As the component parts of all new machines may be said to be old[,] it is a nice discriminating judgment, which discovers that a particular arrangement will produce a new and desired effect. ... 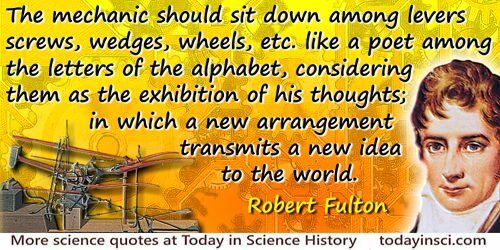 Therefore, the mechanic should sit down among levers, screws, wedges, wheels, etc. like a poet among the letters of the alphabet, considering them as the exhibition of his thoughts; in which a new arrangement transmits a new idea to the world. A Treatise on the Improvement of Canal Navigation (1796), preface, x. From the intensity of the spots near the centre, we can infer that the protein molecules are relatively dense globular bodies, perhaps joined together by valency bridges, but in any event separated by relatively large spaces which contain water. From the intensity of the more distant spots, it can be inferred that the arrangement of atoms inside the protein molecule is also of a perfectly definite kind, although without the periodicities characterising the fibrous proteins. The observations are compatible with oblate spheroidal molecules of diameters about 25 A. and 35 A., arranged in hexagonal screw-axis. ... At this stage, such ideas are merely speculative, but now that a crystalline protein has been made to give X-ray photographs, it is clear that we have the means of checking them and, by examining the structure of all crystalline proteins, arriving at a far more detailed conclusion about protein structure than previous physical or chemical methods have been able to give. 'X-Ray Photographs of Crystalline Pepsin', Nature (1934), 133, 795. I find that by confining a workman to one particular limb of the pistol until he has made two thousand, I save at least one quarter of his labor, to what I should provided I finishd them by small quantities; and the work will be as much better as it is quicker made. ... I have some seventeen thousand screws & other parts of pistols now forgd. & many parts nearly finished & the business is going on brisk and lively. Describing subdivision of labour and standardization of parts. Letter to the Secretary of the Navy (1808), in S.N.D. and R.H. North, Memoir of Simeon North (1913), 64. Quoted in Joseph Wickham Roe, English and American Tool Builders (1916), 134. I remember vividly my student days, spending hours at the light microscope, turning endlessly the micrometric screw, and gazing at the blurred boundary which concealed the mysterious ground substance where the secret mechanisms of cell life might be found. Commencement address (1946). As quoted in book review (of Richard Rhodes, The Making of the Atomic Bomb), by William J. Broad, ‘The Men Who Made the Sun Rise', New York Times Book Review (8 Feb 1987), 39. Cited as from 'The Atomic Bomb and College Education' (1946), in Bartlett's Familiar Quotations (18th ed., 2014). as quoted, without citation, in . Please contact Webmaster if you know a primary source. Screw Machine Engineering, a magazine whose name a hyphen would have improved. The dimmed outlines of phenomenal things all merge into one another unless we put on the focusing-glass of theory, and screw it up sometimes to one pitch of definition and sometimes to another, so as to see down into different depths through the great millstone of the world. Are There Real Analogies in Nature?' (Feb 1856). Quoted in Lewis Campbell and William GarnettThe Life of James Clerk Maxwell (1882), 237. The work … was … so blinding that I could scarcely see afterwards, and the difficulty was increased by the fact that my microscope was almost worn out, the screws being rusted with sweat from my hands and forehead, and my only remaining eye-piece being cracked… Fortunately invaluable oil-imraersion object-glass remained good. From 'Researches on Malaria', Journal of the Raoyal Army Medical Corps (May 1905), 4, No. 5, 549. 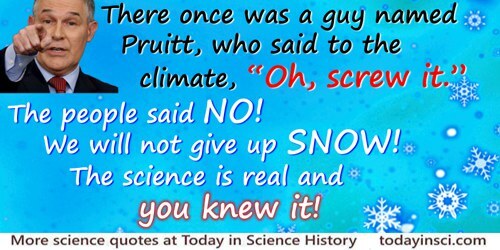 There once was a guy named Pruitt / Who said to the climate “Oh, screw it.” / The people said NO! / We will not give up SNOW. / The science is real and you knew it. Sign carried by a protester during the People’s Climate March, Washington, D.C. (29 Apr 2017). Pictured on Twitter @123catherinep. Note: Scott Pruitt was the (very short term) then head of the Environmental Protection Agency (EPA). When you can dump a load of bricks on a corner lot, and let me watch them arrange themselves into a house — when you can empty a handful of springs and wheels and screws on my desk, and let me see them gather themselves together into a watch — it will be easier for me to believe that all these thousands of worlds could have been created, balanced, and set to moving in their separate orbits, all without any directing intelligence at all. In 'If A Man Die, Shall He Live again? ', More Power To You: Fifty Editorials From Every Week (1917), 218-219.